On a clear winter’s night, I would expect a casual but upscale restaurant on the south side of Watertown to be bustling, with maybe a 15 or 20 minute wait for a table and a packed bar. 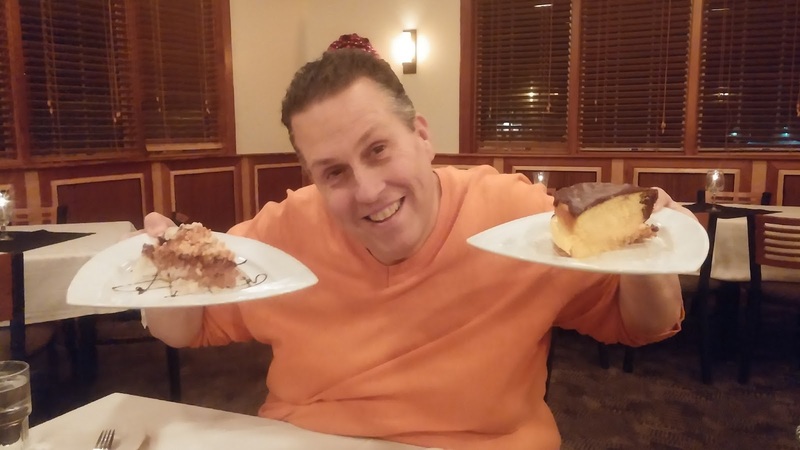 When I blogged about Ives Hill Country Club a few years ago, that was certainly the case, but on a recent Saturday night, our table of six was the lone occupied space in the attractive, comfortable dining room. I don’t know why word hasn’t gotten out about this place, but if you like eating out in a relaxing, quiet environment with attentive service and expertly seasoned food served in big portions, you should probably get in your car this second and make a beeline for Ives Hill. I have a feeling those tables are going to fill up fast. We started with a round of water and adult beverages, plus the monsoon shrimp ($16). 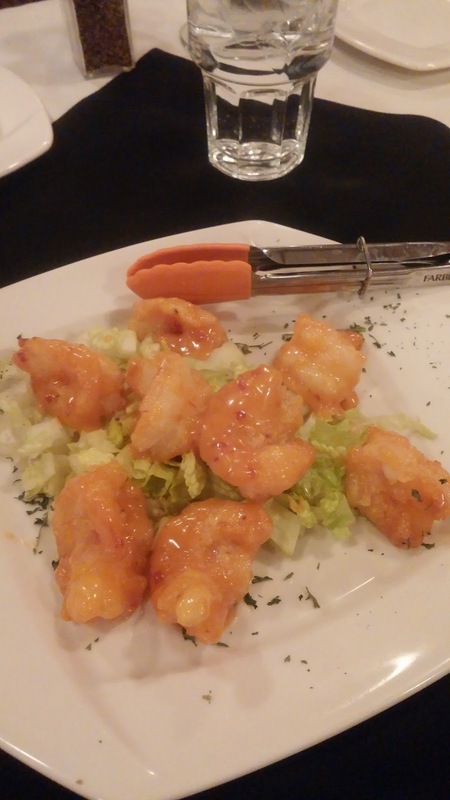 Eight large, butterflied shrimp arrived on a bed of lettuce, the light fry on each absorbing just enough sweet chili sauce to really hold on to maximum flavor. My very first bite delivered a punch of sweet heat that didn’t compound to too much spice on subsequent bites, but just tingled the taste buds. Everyone at the table loved these tangy, honeyed shellfish. The tomato, basil and goat cheese dip ($14) was served hot and with a bowlful of airy, crunchy triangles of ciabatta bread. 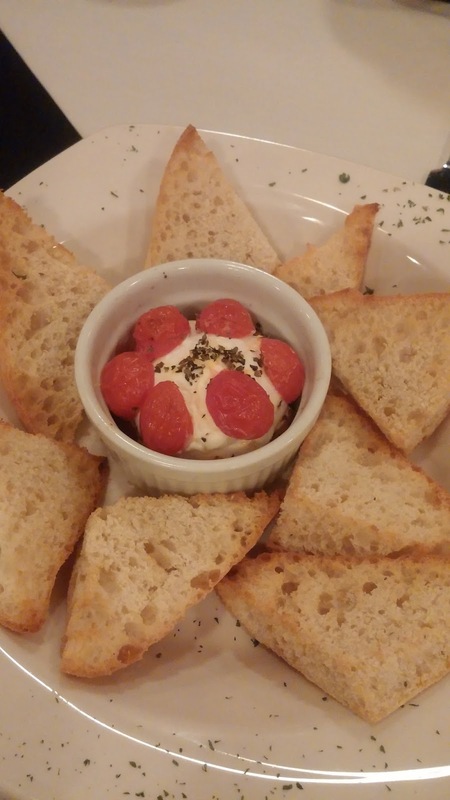 The earthy, creamy goat cheese sang with plenty of tang to counter the sweet, plump grape tomato halves, nutty olive oil and dried basil in the mix. Even with a good amount of cheese and tomato smeared on one of the toasted bread points, the ciabatta stayed crisp, for good textural contrast. A cup of zucchini soup ($5) turned out to be more bowl-sized, and was served with Town House crackers. 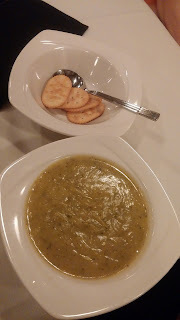 The soup was another stunner, packing a wallop of black pepper piquancy against a backdrop of deep, roasted zucchini flavor mellowed out with cream. It was thick and rich, absolutely delicious on a wintry evening. If you remember Dante’s Pizzeria from days past in Watertown, Ives Hill is serving the Dante’s classic pie you’ve been missing. 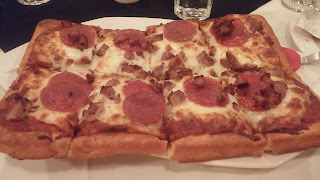 Topped with pepperoni and sausage ($13), this was eight square slices of crisp, light, buttery crust with good spice from the pepperoni and saltiness from the fennel sausage. The sauce and the cheese on this were both flavorful, but for me, it was all about that crust, which sported well-developed, unique flavor. The texture of it was incredible, crunching as you bit through it, then collapsing into buttery richness in the mouth. 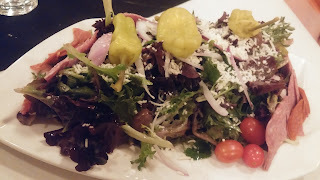 The antipasto salad ($15) was a massive platter of mixed greens dressed in a wonderfully acidic and sweet balsamic vinaigrette, piled high with thin slices of salami and pepperoni, thick slices of red onion, lots of tangy pepperoncini, black olives, grape tomatoes and shredded Parmesan cheese. A lot of people order salads when their appetites are on the lighter side, and if that’s you, you’ll have leftovers of this one for days. A basket of rolls had to be requested from our darling waitress, Gabrielle, who was new in her job but took great care of our table. The rolls — crusty, white, with a soft interior — were so hot, we guessed she had heated them inside Mount Vesuvius. Maybe there's a teleportation portal in the kitchen at Ives and no one's telling us? I suspect these were straight from the food service truck into the volcano, but everyone at our table adored them anyway. The pesto-fredo with chicken ($18) wasn’t too rich or too heavy, although it could easily have been either or both, given the sauce was made of about equal parts pesto and alfredo sauce. The flavors of each ingredient of the walnut/basil pesto shone through and weren’t overpowered by Parmesan at all, even though that nutty cheese can be very bossy on the palate. 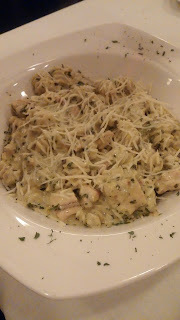 The grilled chicken slices were tender, and I liked that the pieces were cut the same size as the raddiatore pasta, a thoughtful touch that helped balance the flavors of the dish even further — because you got a little chunk of meat and some pasta on just about every forkful as you ate down through the enormous bowl. The steak salad ($17) was another mammoth platter, similarly dressed in that well-seasoned and balanced balsamic vinaigrette. 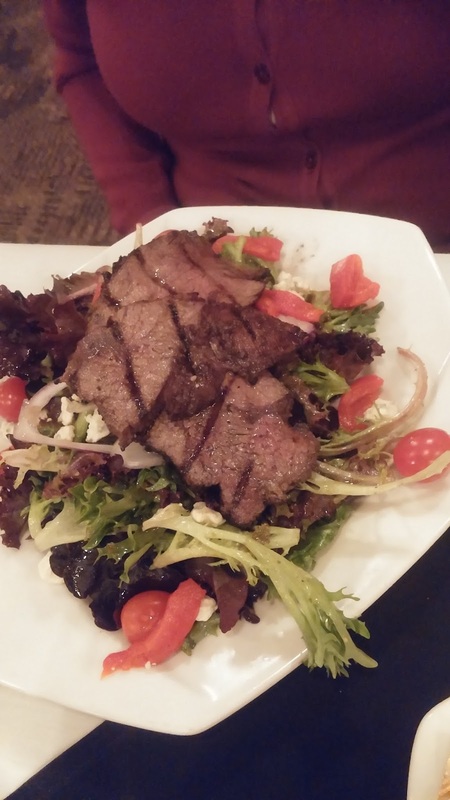 The steak on this one was tender and juicy, marinated before grilling in Italian dressing and balanced with sweet roasted red bell peppers and funky, earthy crumbled blue cheese. 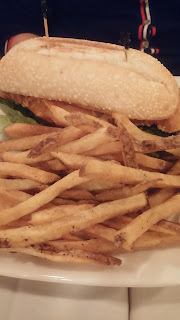 The fish hoagie ($15) came with a heap of hand-cut, perfectly seasoned French fries, which soothed my inner food critic crank right away. The sub started with a crusty, toasted bun and cooling lettuce and tomato, and culminated with a very robustly crunchy beer-battered haddock filet. The fish was moist, and that beer batter was a little salty and a little malty for sweetness. Again, I liked that while Ives has upscale entrees, the pub grub is terrific, too. The beef tenderloin medallions ($26) were cooked right to order (in this case, medium) with lots of pink and a very succulent, tender interior. The sauce served with them, a mustard demi-glace, may have been too salty for some diners, but I liked the assertive, deep meaty flavor and the sharp zest of the Dijon in it. 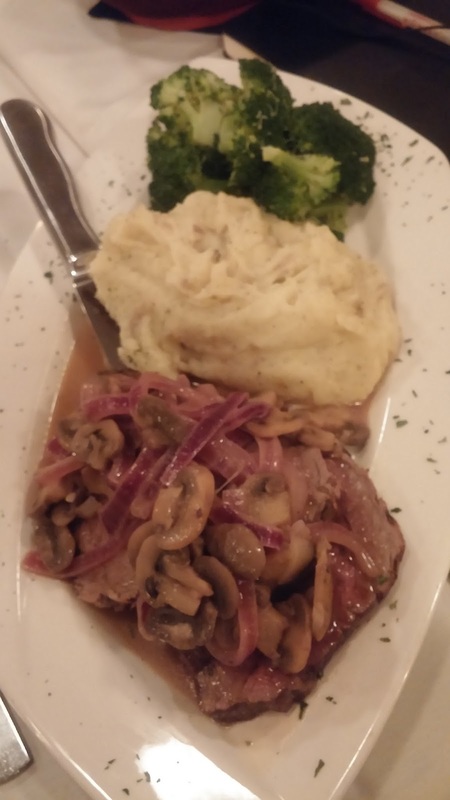 Sautéed mushrooms and red onions smothered the top, and a mound of creamy, peppery mashed potatoes on the side was an excellent foil for the highly seasoned sauce and steak. Steamed broccoli spears on the far end of the plate were bright green, crisp-tender and unadorned with anything but the clean, cruciferous flavor of the vegetable. The desserts at Ives Hill are made in-house, as the pastry gods intended. The Boston cream pie ($7) was our favorite, with its moist yellow cake, chocolate frosting and vanilla cream filling taking equal flavor billing in each bite. Snickers pie ($7) was a little less flavorful. This dense chocolate and peanut confection was sugary, but not very chocolatey. The coconut cream pie ($7) was my least favorite, but another diner’s top pick. I found it to be very bland with no pronounced coconut flavor at all, but other diners liked the flaky crust and vanilla filling. The mystic mocha pie ($7) was almost a torte or a flourless cake. It was deeply chocolatey, rich, and smooth, with that dry cocoa flavor in the background and a decadent finish of pure butterfat. Wow. Our feast for six, with two appetizers, three adult beverages and four desserts, came to $204.66. That’s certainly not a bargain, but you could also eat sandwiches and pizzas here for a much more frugal check. At least three of us brought home leftovers, as well. The portions are beyond generous. To boot, as we were walking out, Gabrielle offered to wrap the tenderloin doggy bag in plastic wrap for us, so the sauce wouldn’t leak. What a thoughtful server! I award Ives Hill Country Club an eight on the Big Hungry Scale. I think those with more conservative palates will find some of the seasoning here to be too assertive, but I very much liked everything we were served, save the coconut pie. If I lived anywhere near Ives Hill, it would be a regular hangout for me, and that’s one of the best things I can say about a place. The reason is that the menu is diverse, with Italian, meat and seafood entrees, pizzas, burgers, sandwiches, salads and creative appetizers, and the wide variety of dishes we tried were all scrumptious. Just about everything we tasted was made from scratch, and there were small twists to common dishes — like chicken Parmesan served over macaroni and cheese — that distinguish this place from your average north country restaurant. The relaxing atmosphere and utter lack of pretense served with the food make this an enjoyable destination for a date night or boys’ night out (or girls’ night out!). And since word hasn’t seemed to creep out yet, your table just might be available tonight! If you like pretty pictures of amazing food, make sure you're following me on the Big Hungry Shekby Facebook page and on Instagram @BigHungryShelby, because I'm headed to Philly for loads of good eats this weekend, and I'll be giving glimpses of it all as I eat my way through one of my favorite food towns! My personality is big; my hunger is bigger!